Posted on January 2, 2016, in Criterions, Film, Podcast. Bookmark the permalink. 8 Comments. You know the question about which films would you take with you if you were going to be abandoned on an island and could only take so many? One of mine would be A Room with a View. This plays out in the film’s contrasts–Straight hedges England versus wild and unkempt Italy. Uninhibited, open to new experiences Eleanor versus uptight Charlotte. And, most of all, Cecil versus George, for what is Cecil after all if not institutionalized? And what is George if not pure and natural? Heck, he’s hanging from a tree shouting his barbaric yawp at one point. Mr. Beebe is right about Lucy. Fortunately for her, George comes along and saves her from an insufferable corseted life with Cecil. Speaking of Cecil, I thought Lewis was brilliant. He manages to portray the fop as sufficiently off-putting without being entirely unsympathetic, which he might easily have been. Great comment. If we have time, we might bring up the Emersonians. As Trevor noted in his review, Cecil tended to go with the obvious for names and that was clearly the case here. Happy New Year, Aaron. I look forward to reading Criterion Blues in 2016. Happy New Year, Jim! Likewise to Poetry in Motion! 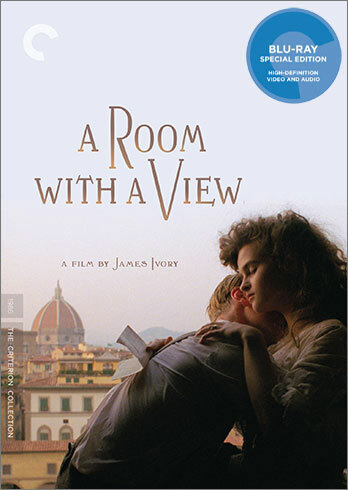 A Room With a View was a well-received and Academy awarded film that recently got the Criterion Collection blu-ray treatment, and Aaron West and I discussed it on the Criterion Close-Up podcast. Merchant Ivory Productions deserve to be seen in high-definition. Sorry guys…and the elusive Trevor, but I just couldn’t get into this. Beautiful film. Outstanding cast. Sooooo boring. Maybe I’m just not accustomed to all that fanciness here in Kentucky. If bullets are flying or we’re looking at historical figures, then I do enjoy period pieces. However, the plot seemed very light to me. The love story was very tame and the socioeconomic aspect was underwhelming. I disconnected from the story fairly early and was left to be entertained by Daniel Day-Lewis and Marla from Fight Club acting prissy. I got more enjoyment in this as a comedy than as a romantic period piece. I didn’t dislike the film, but would only give it a 6/10. Outstanding discussion on the film nonetheless!